We offer a full range of general dental services, many of which are listed below. Click on the underlined words to find out more about these services. Should you ever like to discuss alternative materials, we have them available for use or we can order them. Please ask us and we will discuss the pros and cons with you. These experts have earned our trust and will assist us in providing you with the excellent dental care that you deserve. Cleanings – Getting your teeth cleaned is an excellent way to prevent problems and to catch problems early so they can be easily treated. The American Dental Association recommends that you get your teeth cleaned twice a year by a professional hygienist or dentist. During your cleaning we will check your previous dental work, scale, polish and floss your teeth, and check any areas that may be bothering you. We will also take check-up x-rays to make sure that you don't have any cavities or other problems that require attention. 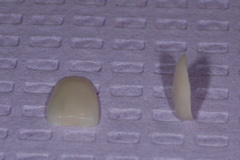 Crowns – Crowns (commonly known as caps) are prescribed when there is too much missing tooth structure to do a filling, to support cracked or fractured teeth, to restore badly decayed teeth, to reinforce teeth in preparation for partials or after root canals, or to restore teeth if they have been badly worn down. Bridges – We will prescribe a bridge when one or more teeth are missing and the teeth on either side of the space are healthy and stable. Bridges can be made from gold for optimum function and reliable long wear, porcelain fused to gold for strength and beauty, and high strength metal-free porcelain for optimum esthetics. Dentures – If you have lost all of your natural teeth, dentures can be made to replace your missing teeth – improving your health as well as your appearance. Dentures can prevent the sagging of facial muscles which can make a person without dentures appear much older. 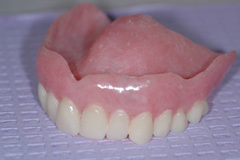 Dentures also enable you to speak and chew better than with no teeth. We are constantly updating our collection of available denture teeth and natural appearing artificial gums to improve your appearance and health. Extractions – Should your tooth have a poor prognosis or be broken beyond repair, we may recommend an extraction. Dr. Kurt Gossweiler has had special training in the extraction of teeth. While he may still refer some patients to a specialist, he treats most patients himself. Fillings – Dental fillings have been around for hundreds of years, but materials have changed drastically in the last several decades. We use state-of-the-art materials to replace decayed or broken-down teeth including: gold for optimum function and worry free high-strength fillings, porcelain for optimum strength and good looks and composite resin for natural appearing smaller non-load bearing areas. Although mercury amalgam was the choice years ago, most dentists today don't use it and we have moved away from it as well. Implants – If replacing a missing tooth is what you're looking for, then dental implants are one of the most conservative treatment options available. Implants are biocompatible posts that replace the root of a missing tooth allowing the dentist to then attach a post and a customized crown or bridge to the implant. Your new tooth will look and feel like your own natural teeth and will be stable and strong for many years. Laser Dentistry – Our office uses the Picasso laser for a variety of procedures to make your experience and post-operative recovery as comfortable as possible. 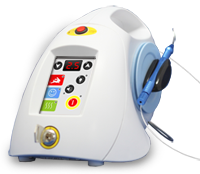 The Picasso laser is a soft tissue laser manufactured right here in Indianapolis. Nightguards – Fully one third of our patients grind or clench their teeth at night. This grinding is extremely destructive to the teeth. So far, no one has discovered how to stop this behavior for those people who have it. 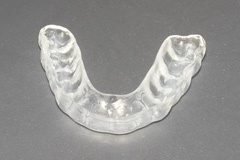 The only way to protect teeth subjected to this kind of force is to cover them with a custom-made acrylic nightguard. This is a hard plastic covering that can withstand the force of most peoples' bite and can save tooth structure from wearing away beyond repair. Oral cancer screening – Oral cancer is a deadly form of cancer that has found little improvement in treatment throughout the years. Early detection is of paramount importance and the Velscope can help. 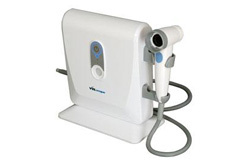 The Velscope is an oral cancer screening tool that fluoresces normal tissue and allows us to better visualize and decide what tissue is healthy and what tissue may need to be biopsied. While the Velscope is not a substitute for the judgment and observation of the doctor, it is a valuable tool that can be utilized to help in making a diagnosis. Should you desire or need a Velscope exam, we have it available for use. Root Canal – Endodontic treatment, also known as root canal therapy, is a procedure that is done to save teeth that are infected or inflamed. Infection or inflammation of a tooth can happen because of decay, fracture, because of deep fillings, or for no apparent reason at all. Most teeth will need crowns after root canals so they don't fracture apart but with proper care these teeth can last for years. Tooth Whitening (Bleaching) – Most teeth that have yellowed with time can be whitened with a bleaching compound applied to plastic strips or administered in a custom-made tray. This whitening can last for years until it needs to be retreated. Veneers – Unlike a crown, veneers are facings that are permanently cemented onto the front of a tooth to give it a different color and/or shape. 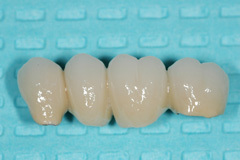 Veneers can be some of the most beautiful restorations that can be done in dentistry. Two different types can be done including porcelain veneers with or without tooth preparation, and composite resin veneers. 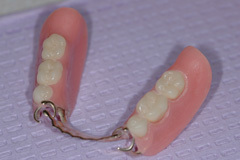 Partials – Otherwise known as a partial denture, these are removable appliances that can be placed on the upper or lower jaw and connected to other teeth to stabilize it. 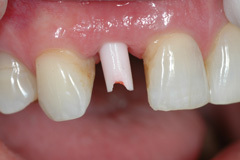 These are generally prescribed when multiple teeth are missing and bridges cannot be done to fill the space. 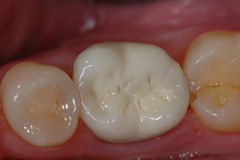 Inlays & Onlays – Inlays and onlays are some of the most ideal restorations that can be done in dentistry. Not only do they conserve tooth structure that might otherwise need to be sacrificed, but they can last for many years and look as lifelike as your own teeth. 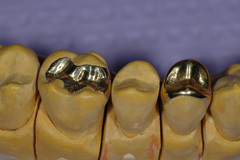 They are prepared like a regular filling, then an impression is taken and the case is sent to the lab to be made. A temporary filling is then placed in the tooth until a later date when the final inlay or onlay is permanently cemented in the tooth. Wisdom Teeth – The last teeth to erupt into your mouth are your wisdom teeth which generally are supposed to erupt around age 18. Many people don't have enough room for them and the doctor may prescribe them to be removed for various reasons including decay, impaction against other teeth, tumors that form around them, or pain from gum infections in the area. Many orthodontists will suggest that they be taken out after your teeth have had braces so that no further movement can occur to the other teeth. X-rays – The American Dental Association recommends that you have dental x-rays once yearly to check for cavities. It's a well-known fact that treating cavities early saves tooth structure and prevents further, more involved work. For your safety and convenience, we have state-of-the-art digital x-rays that require extremely low doses of radiation. Click here to see a radiation chart.